Lately I’ve seen that several blogs I follow are publishing articles about hipsters. While I’m generally annoyed by the whole hipster thing (especially since I think Chuck Taylors and glasses are fashionable by themselves), this is just too much. It’s like my fellow bloggers are drinking some kind of invisible Kool-Aid, rendering them unable to see the irony about hipsters that most of us can see. So I’m gonna rant about it. Here we go. A hipster is someone that embraces individuality and the counter-culture; someone who does not feel the need to conform and who can stand tall in society, proudly bearing their personal tastes and beliefs for all to see. Teddy Roosevelt: While he was a Republican (through his presidency anyway), this guy was definitely politically progressive, perhaps illustrated best by his wild adventures in trust busting. He could even be thought of as one of the early proponents of “going green” with his advocacy of natural conservation. Independent thinker? Check. This guy read thousands of books during his lifetime and wrote more than 35 of his own. As an advocate of “the strenuous life”, he did crazy things like skinny dipping during winter and having singlestick bouts right before White House meetings. Yup, Teddy was definitely a hipster. Lady Gaga: Most pop stars are content to travel a well-beaten path: use tired beats, dress the same as everyone before them, and gradually get skankier and skankier. Lady Gaga’s a little different. Ok, a lot different. Say what you want about her, but Gaga is one artist who’s unafraid to be be “weird”. Her integration of unorthodox fashion and art into her music says a lot about the way she thinks, and the fact that she’s still innovating after all her insane success is notable as well. Martin Boehme: While not as famous as the last two, I still consider my good friend (and contributing writer around here) Martin to be a “hipster”. As a pasty white kid from Council Bluffs, Iowa who’s never been outside of Iowa and Nebraska, Martin’s independent nature has led him to become fluent in Spanish and semi-fluent in French, and get damn good at rapping. This guy cares about what people think of him just about as much as a honey badger cares: not at all. Why else would he buy a custom-made pair of pink jogging pants with Mel Gibson’s face on them? (by the way, they’re hilarious) Yep, Martin fits the definition of hipster pretty well. I think we can all agree that the aforementioned people would be hipsters. The most convincing fact that will attest to this is that none of them have anything obvious in common. A huge part of being a hipster – at least by the definition that most people agree on – is emphasizing one’s individuality and not conforming to any norms, be they societal or of a subculture. 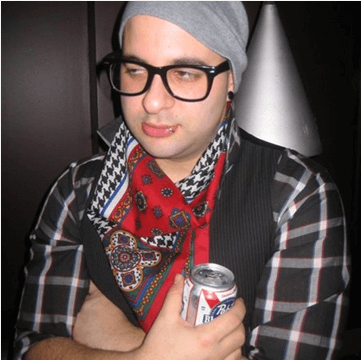 So why then do all the people who consider themselves to be hipsters invariably look something like this? A lof of these behaviors seem crazy, depraved, and downright stupid, but the fact remains that many people start doing them because they’ve somehow become part of this “subculture”. And, as more people do it, it becomes more popular. It’s almost as if a group of people started a cult with a bunch of set rules, and then named it by ironically hijacking a word with the complete opposite meaning (namely, there shouldn’t be rules or norms). Oh, The Hipsters You’ll Meet In College – how can you possibly create subcategories in a culture that’s all about not being categorized? How To Dress Like A Hipster – I honestly can’t think of anything more contradictory to the definition of “hipster” than a checklist on how to look like one. Seriously, if people are actually looking to guides like this for guidance, then I ought to just quit blogging and start selling a single t-shirt that says, “I Don’t Conform to Stuff, Bro” – I’d make a killing. Hipster: someone whose wardrobe is a combination of Hot Topic and their grandparent’s closet, and who has been on the Internet more than most people. There. That wraps up the fashion sense and obscure tastes quite nicely. The other things I’ll just relegate to stupidity (Pabst is crap and fixed-gear bikes are mechanically inferior). If you did like this article, clicking the Like button floating over at the left is appreciated.